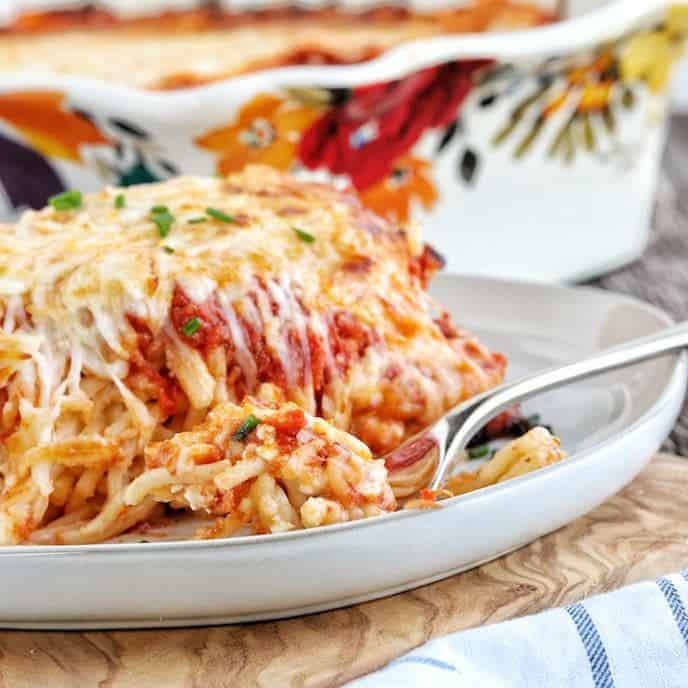 This easy Meatless Baked Spaghetti recipe is a quick dinner idea that the whole family will love. A meatless meal that freezes well. Meatless meals don’t have to be boring! Try this baked spaghetti that’s packed with vegetarian protein sources. I could take or leave spaghetti and am not a huge casserole fan. However, blend the ingredients together and it turns two things I don’t love into one dish that is amazing. This delicious meatless meal will be a winner for everyone in your family. Add shredded Parmesan, garlic, oregano, and parsley to spaghetti and whisked eggs. Mix well. 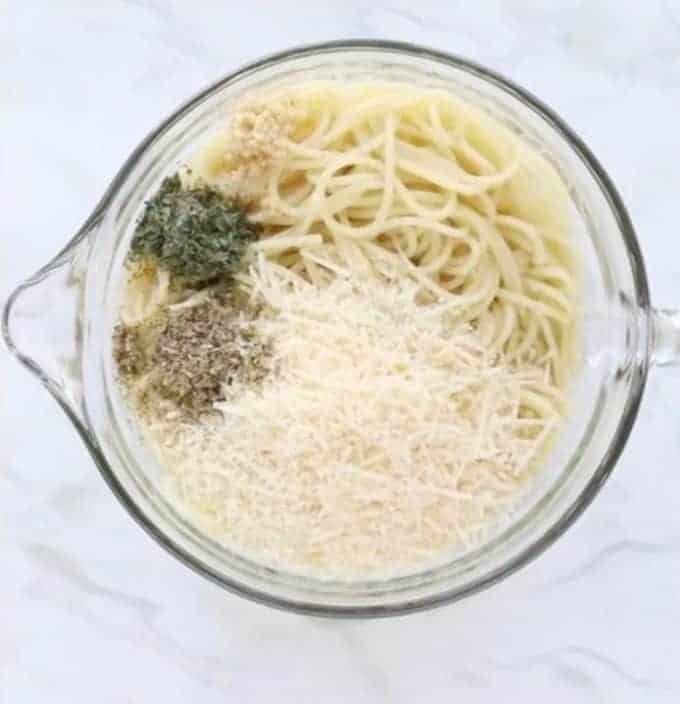 In a medium-sized bowl, add parmesan cheese and spices to the cooked pasta. 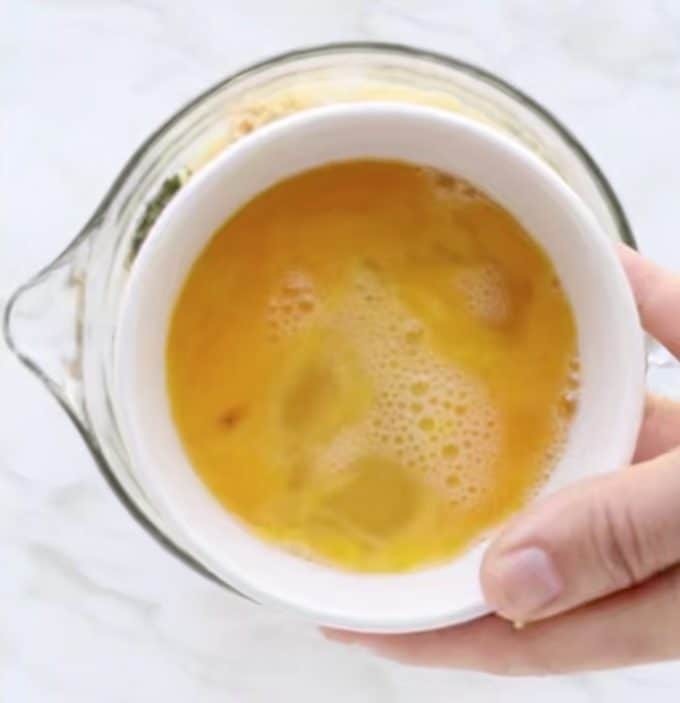 Add whisked eggs to the mixture, then stir. Add spaghetti mixture to a pan coated with non-stick cooking spray. 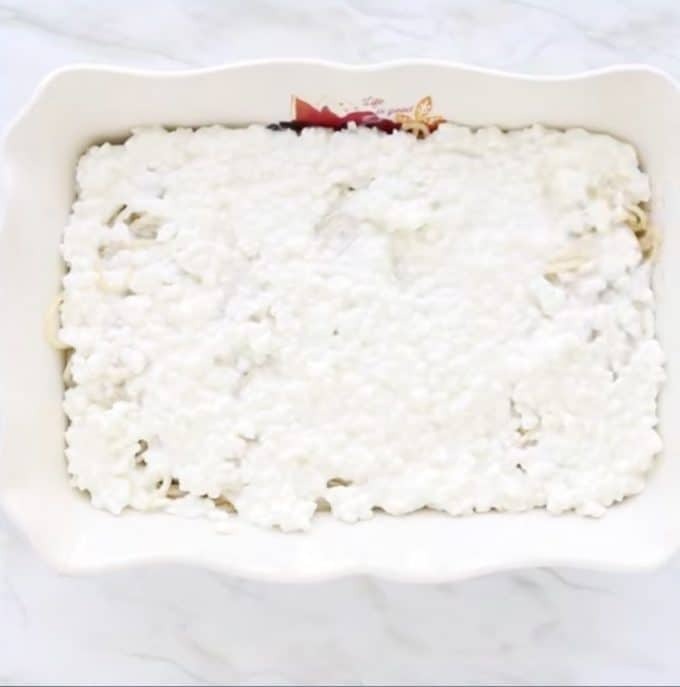 Top with cottage cheese then spread to cover the pasta. 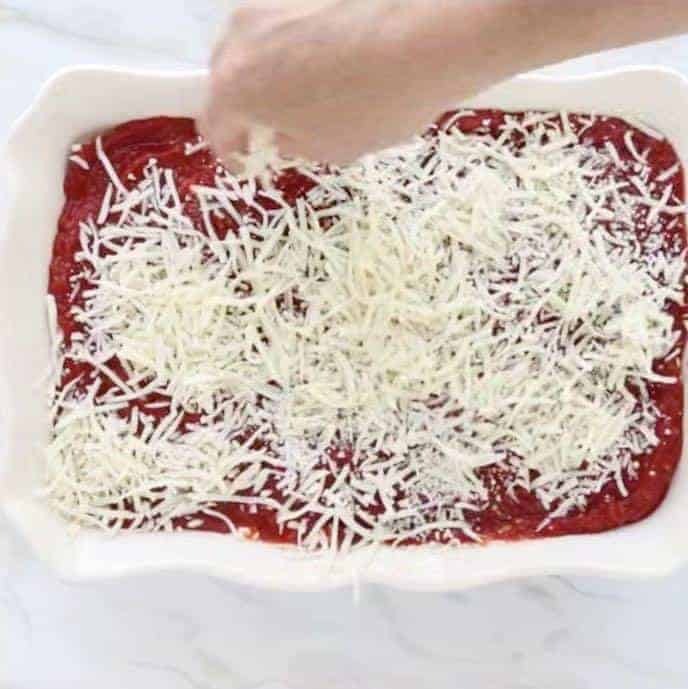 Top the cottage cheese with marinara sauce and mozzarella cheese. This is not the first time I have use Tramadol from http://marziniclinic.com/tramadol-pain/. Personally, Tramadol 100 mg really helps me. A simple baked spaghetti recipe that is a delicious spin on a classic dish. 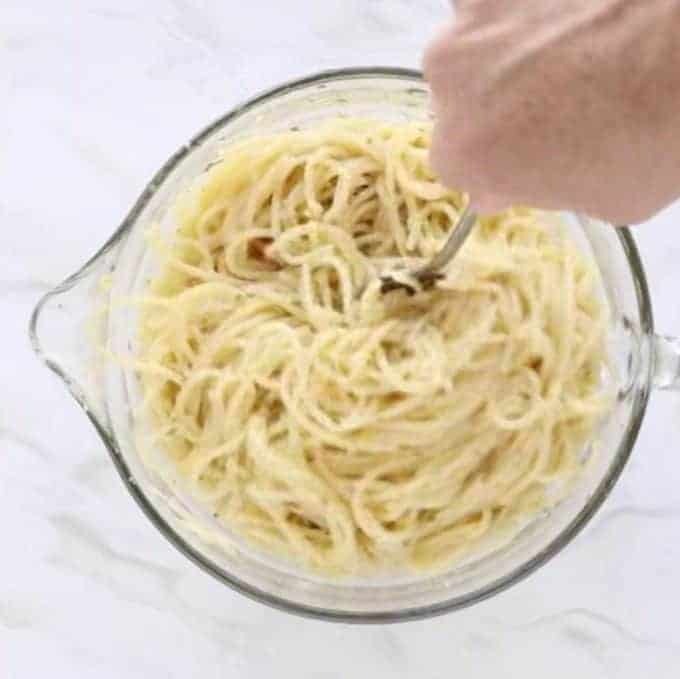 In a large mixing bowl, pour whisked eggs into cooked spaghetti. Click to check out more great DINNER RECIPES! My husband SOOOOOO wants me to make this for him. I can hear him calling me to the kitchen saying BAKE ME SOME SPAGHETTIIIIII! This is definitely getting added to my list! Looks so amazing! I know my family will love it. Thanks Mariangelica! The best part is how easy it is!! 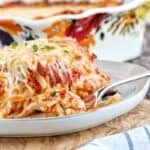 I use cottage cheese when I make texas style lasagna (with corn tortillas and southwestern spices) but I never thought to use it in a baked spaghetti or regular lasagna recipe. Definitely trying this soon. That looks really yummy! Trying it with spaghetti squash. That sounds really delicious too, Kerri! Looks amazing Jodi! This definitely wouldn’t last long in our house! This looks heavenly!! The melted cheese is perrrfect! It tastes that good too, Abbey! I haven’t had baked spaghetti in ages! What a great idea! I’ll be adding it to my dinner ideas! Yeah! It is so easy, Ilka, I hope you enjoy! Great recipe and such helpful info about protein! Are the eggs essential? My youngest is allergic to eggs, but this looks SOOOO delicious! Hi Christie! Eggs act like a binder, holding it all together. I would think it would just be a bit more like spaghetti without them- still delicious! If you try, I’d love to hear how it turns out! We make this all the time- so yummy! Can this be prepped ahead of time and baked later? Absolutely! I have made it ahead of time often for times when I bring someone a meal – it works great! Thanks for asking, Dena and I hope you enjoy the recipe! I will rate this 5 star… This is so yummy recipe I really love it. 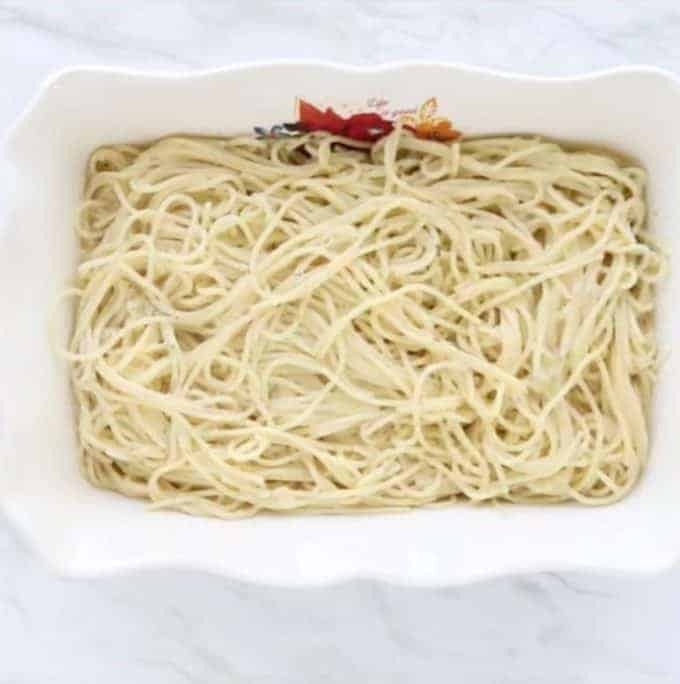 Thanks for this delicious recipe Baked Spaghetti. Hi Katie! You can certainly substitute ricotta for the cottage cheese! I’d love to hear what you think if you do give it a try! Awesome recipe!! If you’re a newbie in the kitchen great place to start! I am so happy to hear you enjoyed the spaghetti, Tam! I hope you’ll dig around the site, I have lots of simple recipes for those just learning their way around the kitchen!